I realized that for all my discussion of being a speculative fiction writer and wanting to explore speculative fiction erotica, I didn’t actually have any spec fic stories available. Allow me to remedy that. 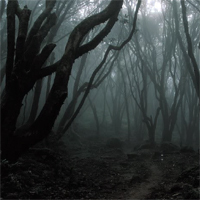 The following is a story that I wrote last fall for the annual ERWA Halloween challenge, which encourages topics in the fantasy, paranormal, and even horror genres. Isabel ran like the devil was chasing her. He might well have been; few other things would drive her to run toward the woods. By all accounts, traversing the woods at night was a risky prospect at best, but entering it tonight, on Witches Eve, was suicide. But the roars of her father behind her spurred her on.